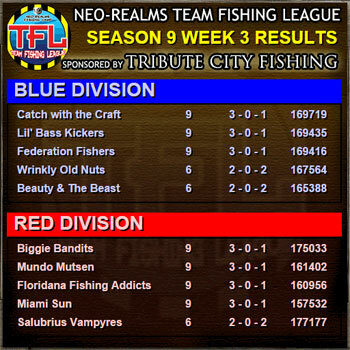 Week 4 has ended with Biggie Bandits atop the Red Division, and Catch with the Craft and Lil' Bass Kickers tied for first in Blue Division. Good luck to all teams this week! 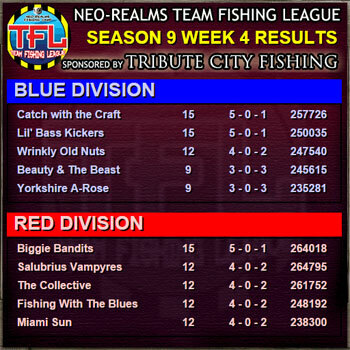 Week 3 is done and with 4 games played Catch with the Craft is ahead in Blue Division, and Biggie Bandits is ahead in Red. 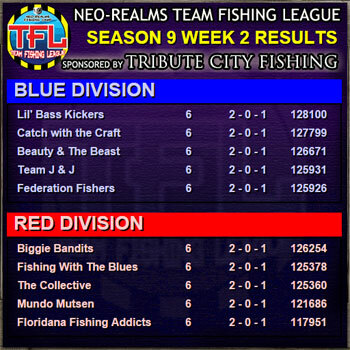 Week 2 sees Lil' Bass Kickers of the Blue Division and Biggie Bandits of the Red Division on top based on total points. No team survived undefeated this week! 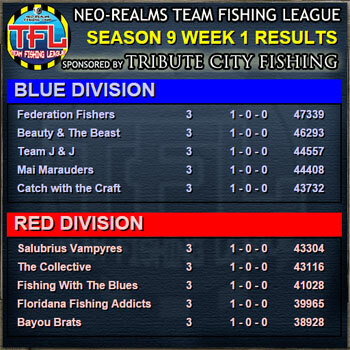 Season 9 is underway and we have the first week's results in! Good luck to all teams next week! TFL Season 9 is underway! The league season has officially begun! Each player has received rod levels (78 levels for 13 team Blue Division or 84 levels for 14 team Red Division) for the season to spend as they see fit. If you don't see a match for your team immediately, your team may have a bye week. The first match must be completed by the end of Sunday, March 22nd. The results of those matches will be posted next Monday. Good luck to all teams this season! And remember there is a 500 Epic Bait and 50 Super Bait participation drawing for non-playoff teams that complete all of their matches!